Most of Africa is recording rapid economic development. While this is positive progress, it poses serious threats to Africa’s terrestrial ecosystems and, if not managed properly, could lead to irreversible and catastrophic losses. This is true also for the blue economy. 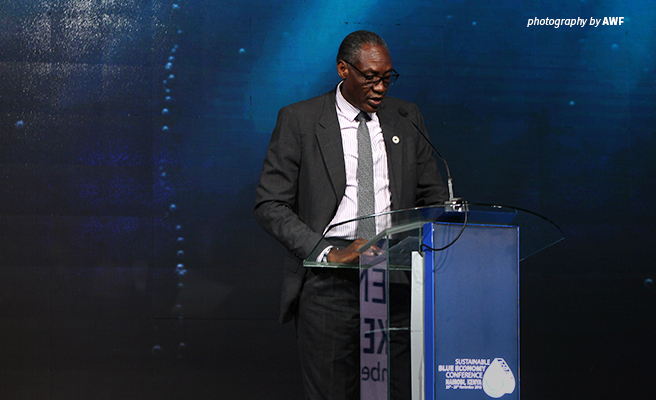 The oceans, as a new frontier for financial capital and exploitation, are critical to sustaining Africa's sustainable economic growth. However, the link between the blue and the green economies goes beyond the coastal areas. For the circular economy to be sustainable, the blue economy cannot be disconnected or isolated from the green economy. The water cycle gives us a great example for all aspects of human life and economic activities (whether blue, green, or otherwise defined). Through the water cycle, both marine and land ecosystems economies are fundamentally interconnected and interdependent. The political, social, and economic decisions African leaders make every day on agriculture, infrastructure, and other development priorities determine the success of the commitments made at the first global conference on the sustainable blue economy, held in Nairobi, Kenya from Nov. 26-28, 2018. At AWF, we believe that to conserve the continent’s oceans and waters, we must also rethink how we manage our terrestrial ecosystems — forests, rivers, wildlife — as well as how we produce food and plan for human population growth. We commit to ensuring that our work in conserving wildlife and wild lands contributes significantly to a sustainable blue economy. AWF believes that for the blue economy to thrive, landscapes and seascapes must be planned and managed together.